Big Issues typically covers books on the week of their release in comic stores, but an exception is being made for March: Book Three, which addresses some of the biggest issues currently faced by the United States. Despite most of its story taking place half a century ago, it’s extremely relevant to what’s happening in the country right now in the middle of an especially bleak, exhausting election year. Voter rights, police brutality, and racist politicians have all played a major role in Rep. John Lewis’ experience as part of the civil rights movement, and 50 years later, the United States’ black community is still fighting these same battles. This summer has been a distressing reminder of just how far the U.S. has to go before it achieves true equality for all its people. Voter ID laws in Texas and North Carolina were recently struck down by federal appeals courts for discriminating against black and Latinx voters; there have been protests across the country in response to the ongoing killings of black citizens by police officers; and one of the two major candidates for the presidency has built his base by spouting hate-fueled, fear-mongering rhetoric. It’s easy to feel hopeless about the future, but March: Book Three shows how important it is to keep faith in the face of overwhelming adversity. March: Book Three hit stands last week, and it’s only gaining more relevance as the election cycle becomes increasingly fraught. In light of Donald Trump’s comments this week that “the Second Amendment people” could be the answer in preventing Hillary Clinton from appointing Supreme Court judges, the book’s scenes involving the assassinations of President John F. Kennedy and Malcolm X serve as particularly chilling examples of how violence against major political figures is used to disrupt meaningful change. Trump and his camp have argued that he was simply talking about gun owners rallying against Clinton when it comes time to vote, but given Trump’s history of inciting violence in his speeches, it’s not hard to understand a more aggressive interpretation of his statement. The shifts within the Republican party that made the rise of Trump possible are touched on in the pages of Book Three, which covers a lot of ground as it details major events in the civil rights movement, starting with the bombing of Birmingham’s 16th Street Baptist Church on September 15, 1963, and ending with the signing of the Voting Rights Act on August 6, 1965. Lewis and his colleagues endured major hardships during those two years, and like March: Book Two, this conclusion often reads like a horror comic as it emphasizes the danger and sense of dread that surrounds those committed to fighting for civil rights in the South. That first scene in the 16th Street Baptist Church is one of the most devastating sequences in the entire series, largely because of how Lewis, co-writer Andrew Aydin, and artist Nate Powell choose to introduce the reader to this environment and these characters. The scene begins with a woman checking on four girls in the women’s bathroom, interrupting their conversation to remind them that the Sunday service will start soon. The tiny snippets of their conversation, written with small, wispy lettering that evokes the hushed whispers of girls careful not to be discovered, quickly give the story a personal, grounded perspective, which is reinforced by the proceeding interaction of that unnamed woman with the mother of one of the girls. The tone and pacing are very relaxed, but for readers who know about the horror that is coming, the casual storytelling heightens the tension. The calm of these opening pages eases the reader into this world and invites them to get comfortable, which intensifies the impact of the blast that shatters these innocent people’s lives. The “clik” of the older woman’s shoes against the church floor and the “boom” of the bathroom door getting pushed open establish an auditory landscape for the scene. With the reader thinking about the sound in this space, the huge “BOOM” of the explosion hits even harder, and Powell uses sound effects to amplify the drama throughout the story. The first image of March: Book Three is technically a small illustration of the station wagon driven by Mickey Schwerner, Andy Goodman, and James Chaney, three Student Nonviolent Coordinating Committee volunteers who lost their lives for the cause, but the first panel of the story shows a pair of feet walking across a church floor. These are the feet of the woman who will be the last person to see the four young girls who were killed in the bombing. It’s appropriate that the final entry in the March trilogy would begin by showing feet in motion. That woman is walking toward tragedy, but by the end of the book, feet are marching toward victory. The people walking across Selma’s Edmund Pettus Bridge aren’t wearing their Sunday best; their shoes are weathered with the many miles they’ve covered to reach this moment of triumph. Those shoes are a symbol of the tough, unwavering spirit of perseverance that keeps those protesters moving. 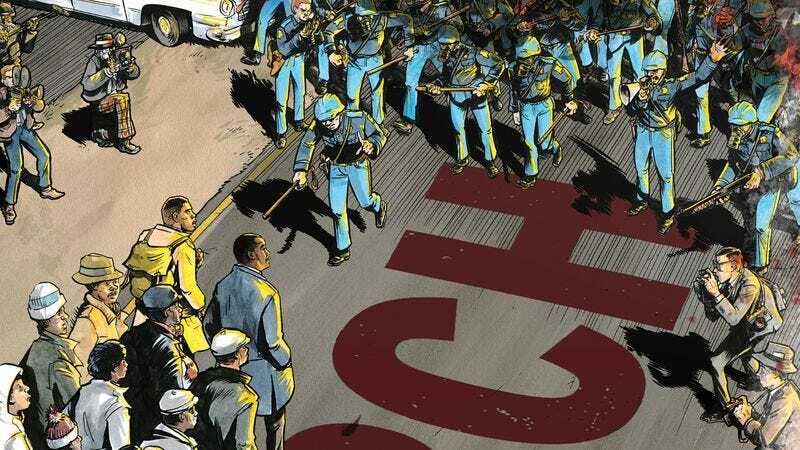 March: Book Three primarily focuses on the fight to give black citizens the right to vote in the South, where state practices preventing them from registering went unpunished by the federal government. Atrocities like the 16th Street Baptist Church bombing would continue as long as racist segregationists like Alabama Gov. George Wallace remained in office, and civil rights groups started to push even harder to gain the right to vote for every adult in Alabama and across the South. Lewis and Aydin’s story for March: Book Three goes into considerable detail to help readers understand the complexities of the political situation at the time, but that doesn’t come at the expense of a compelling emotional narrative. The story addresses macro issues, but it doesn’t lose sight of the personal experiences of the people on the streets, experiences that, far too often, end in trauma or death. Many people gave their lives on the path to the 1965 Voting Rights Act, and March: Book Three pays tribute to the fallen with deep reverence for their sacrifice. The pain of each loss is fully conveyed in the writing and artwork, but so is the joy of each gain, big or small. Moments of levity and celebration like Lewis dancing with Shirley MacLaine at an SNCC party and traveling to Africa (where he would see Malcolm X for the last time) prevent the story from becoming oppressively sad, and the framing device of Lewis witnessing President Barack Obama’s inauguration adds an undercurrent of optimism to the narrative. The United States would not have a black president if Lewis and his colleagues hadn’t stood up to an unjust system and demanded their right to vote, and at 76 years old, Lewis is still fighting for change in Congress, most recently by staging a sit-in protest over gun control in June. March is a series that needs to quickly be incorporated into school curricula, ideally at both a high school and college level. It’s educational value is astronomical, both as an autobiographical account of a major period in American history and as a piece of art showing how to depict a nonfictional story in a visually exciting, emotionally engaging way. Powell has done exquisite work visualizing Lewis’ experiences with style, soul, and grit, and his energetic artwork gives the book strong forward momentum, even when the pages are predominantly text. He knows when to condense information on the page and when to let a moment breathe. Every element of the artwork is approached with meticulous care, from the linework to the layouts to the lettering. Take the moment when Lewis learns that President Kennedy has died: The page is composed of small, borderless panels peeking out from a black background, building to the moment when Lewis breaks down in tears, overwhelmed by emotion. The panel structure reflects Lewis’ solitude in this moment, and the final line of the page—“But there I was, alone in the dark with it all”—is a brilliant example of using lettering to inform emotion. Powell breaks the line into four different sections on the page. “Alone” is separated from the words that surround it to emphasize isolation, “in the dark” is grouped together to show how important the darkness of the room is to Lewis’ emotional state, and “with it all” is broken down word by word at a downward angle, visualizing Lewis’ descent into despair. March: Book Three is filled with smart, expressive artistic decisions like these, and the story ends with Lewis thanking his future artistic collaborator via his past self. As Lewis heads to work in 2009, he tells his future co-writer, Aydin, that he wants to pursue a comic book idea he has, and that they need to find an artist who “can make the words sing.” That’s exactly what Powell accomplishes in this trilogy, and the sweeping rhythm and rich emotion he brings to Lewis’ story makes March an unforgettable journey to the past that will surely inspire countless readers in the future.